Happy first day of February! My favorite month of the year! Aside from being a "love" month, it is the month of my birthday! To celebrate the month of hearts (though I celebrate it every month! 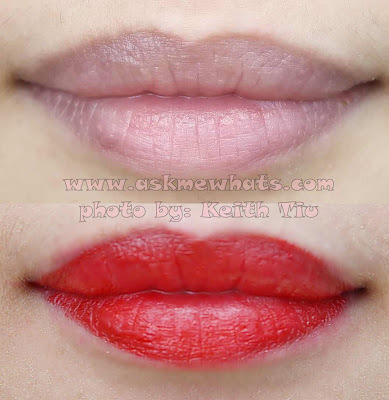 ), I would like to share to you my favorite red lipstick for the year! On a normal day, you won't see me wearing red lipstick except on special occasions or probably special date nights! Why? Well, I may have found a couple of good red lipstick brands that works for my skin tone but I find it difficult to maintain them for the rest of the day without worrying much on lip dryness. Recently, I've shared to everyone my SOS KIT that I received from CloseUp White Now (read post HERE). From that kit, I was able to find my best red lipstick to date! No wonder it's pricey, luxurious, gorgeous --- it's from Coco Chanel! For the first time, I've found a red lipstick that doesn't require me to "prep" my lips several minutes prior to application! I don't need to exfoliate my lips with a damp toothbrush or apply a lip gloss on top just to make sure the crocodile lips in me doesn't show up midday! Rouge Coco is creamy and soft in texture making it easy for me to apply straight from tube. I have tested wearing this product the whole day and so far, it does wear off after eating and drinking but I can easily re-apply the lip color and my lips would remain moisturized! The added plus factor? The gorgeous shade which is true red, neither warm nor cool so I would imagine any women of any skin color would look good in this! This classic red shade also helps make my teeth appear whiter even Mr. AMW exclaimed: "Okay ah!" while taking a shot of my lips! Proud to say: "I'm comfortable and confident with this!" Have you found a perfect red lipstick for the year 2013? What's the brand and shade? That's nice to know, I love Revlon Kissable Just Bitten toO! they are nice. With re: to the price, around Php1,650 siya! I love it on you, girl! Ako din I have been wearing red lipstick since I also got one in my SOS kit. Love it to bits! awwww how to get ba that sos kit? ... i have the mac ruby woo and i have to apply balm sometimes as it tends to dry up my lips..upon reading this post in your sos kit..im greatly convinced to purchase one too :) thanks for sharing! It is my pleasure to share! Can't wear any red lipsticks, may be just haven't found my tone yet. Your red lippies looks so pretty!! Anastacia! who says you can't wear red lipstick? I'm sure red lipsticks look great on yoU! Maybe you just haven't found that one that gives you comfort! :D it is indeed difficult! Love that shade! It looks gorgeous on you! Wow nice shade it looks incredibly lovely on you!! This shade is soo gorgeous, i'm definitely going to try this out!